Does your iPhone (or iPad) keep running out of battery? We show you 33 simple tips to get better battery life from your iOS devices. You might consider your iPhone or iPad to be the most amazing technology in the world, but once their batteries run out, they’re little more than metal-and-glass slabs. Thankfully, it doesn’t have to be like that. In this giant tutorial article we’ve got some brilliant battery-saving tips and tricks that will help you keep your battery running all day long, whether you’re on an iPhone or a massive iPad Pro. Here are the best ways to improve your iPhone or iPad’s battery life, from system-wide settings worth tweaking to third-party apps that you should stop – or start – using in order to preserve battery life. We’ve updated this article for iOS 11, but many of the tips work with earlier software too. Bear in mind, of course, that if your device’s battery life is particularly egregious, even after following our advice, there might be something wrong with the hardware. Then there was the much publicised issue with older iPhone’s being throttled by Apple in order to stop shutdowns linked to older batteries which aren’t able to maintain power as well as newer batteries. As a result Apple agreed to offer battery replacements on iPhones at a reduced price of £25/$29. Let’s start by dispelling a battery-saving myth. But apparently, this isn’t such a good idea after all. Apple Store Genius Scotty Loveless explained back in 2014 that when you close an app you take it out of RAM, this means that when you open it again the iPhone has to load it back into memory. “All of that loading and unloading puts more stress on your device than just leaving it alone,” he wrote. Indeed, Apple itself – in the person of software chief Craig Federighi – confirmed that closing apps doesn’t do anything for battery life. Loveless adds that our fears that apps are draining battery life even when we aren’t using them are unfounded, as they will only update in the background if they are set to in Background App Refresh. “Unless you have enabled Background App Refresh, your apps are not allowed to run in the background unless they are playing music, using location services, recording audio, or the sneakiest of them all: checking for incoming VoIP calls, like Skype. All of these exceptions, besides the latter, will put an icon next to your battery icon to alert you it is running in the background,” he explained. Since iOS 9 there’s a feature called Low Power Mode that reduces overall power requirements and makes your battery last longer. 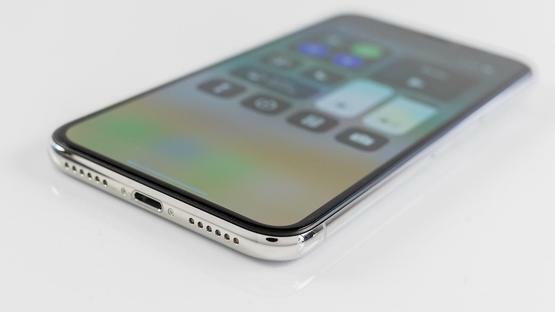 Apple claims the mode will allow you to gain three extra hours of battery life from your iPhone. Low Power Mode isn’t a default option that happens automatically in the background. It will be offered automatically when you hit 20% remaining power: you’ll see a warning flash up and the option to turn on Low Power Mode. Do so and you will notice that the battery indicator turns orange rather than red (or the green it would be if you had plenty of power). The mode will be switched off again automatically when you charge past 80%. If you want, you can enable Low Power Mode without waiting for your iPhone to reach 20%. Go to Settings > Battery and turn on Low Power Mode. 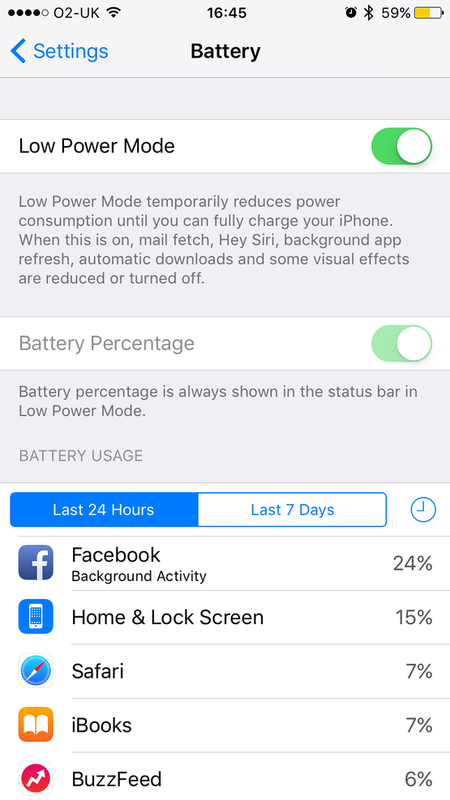 When Low Power Mode is on it will reduce power consumption, stopping Mail fetch, Hey Siri, background app refresh, automatic downloads, and some visual effects. We actually have all those features turned off on our iPhone already, and yet the Low Power Mode still seems to have an effect. NOTE: This tip is for iPhone, not iPad. iPads don’t get Low Power Mode. Updating iOS is a useful all-purpose fix when you’re experiencing minor problems with an iPad or iPhone; Apple uses its regular (free) operating system updates to roll out fixes for vulnerabilities, bugs and glitches, and it’s entirely possible that an issue you’re experiencing can be fixed with a simple OS update. This includes battery problems. iOS 10.2.1, for instance, resolved a known battery/charging issue for iPhone 6, iPhone 6s and the Plus variants of both. 4. Does your battery need repairing or replacing? iPhone batteries don’t last forever, and the time will come when your device needs to be looked at by a specialist. We’d try the tips in this article before making an appointment with an Apple Genius, however. An iOS update in March 2018 helps you to get more accurate advice on when your iPhone’s battery is coming to the end of its life. When iOS 11.3 arrived in March 2018 it bought some changes to the battery information you can find in Settings > Battery. Now, if you visit Settings > Battery > Battery Health (Beta) you will see information about your overall battery health. If your battery is fully functioning you will see the message: “Your battery is currently supporting normal peak performance”. However, you may also see the warning: “This iPhone has experienced an unexpected shutdown because the battery was unable to deliver the necessary peak power. Performance management has been applied to help prevent this from happening again”. The iOS 11.3 update also made it possible for iPhone users who’s phones had been throttled to stop shutdowns to turn off that feature (Apple was criticised initially for not allowing this). If you haven’t installed iOS 11 that doens’t mean there is no battery information. iOS 10.2.1 brought in a useful warning system for when your device’s battery needs to be repaired or replaced. The message simply reads “Your battery needs service” if it is in need of attention. A quick way to check whether there really is a problem with the battery in your iPhone or iPad is to head over to Settings > General > Battery and wait for your Battery Usage report to load up. This will let you check your Usage and Standby times. The Usage time is how long you’ve used the device for since the last charge, and Standby indicates the total time that’s passed since the last charge. Expect usage to be a lot lower than Standby (unless you’ve been using your iPhone non-stop since unplugging it). To test your battery, make a note of the usage and standby times and then put the device to sleep by pressing the on/off switch at the top. After five minutes check the change in the times. If your device is working correctly, the usage time should have have gone up by less than a minute, while the standby time should have gained five minutes. If you see more than a minute increase on the Usage time, something is stopping your phone from sleeping and you have a battery drain problem. 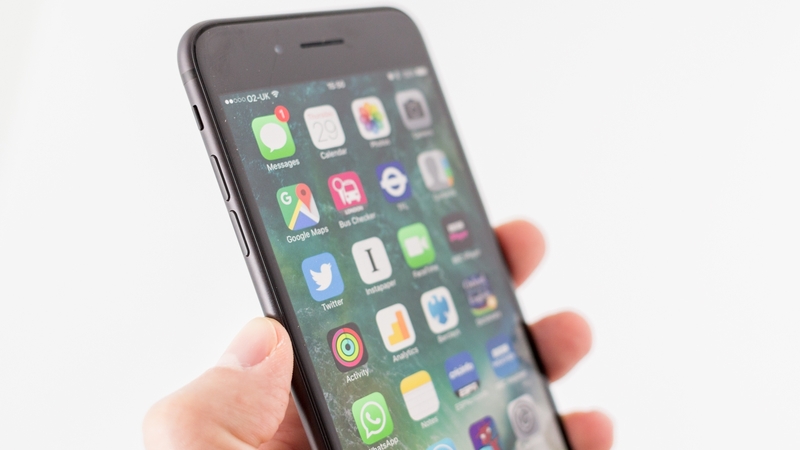 According to Scotty Loveless, chances are that an app or your email settings are responsible for the drain rather than the battery or the iPhone being at fault. Try the following tips to stop unnecessary drain when your iPhone or iPad isn’t in use. We also have a number of tips that will increase battery life in situations when you need the extra boost. Facebook has been accused of being a battery hog on the iPhone and iPad in iOS, and even Facebook itself has admitted that the iOS app uses a lot of resources in the background. A report that emerged in February 2016 from The Guardian claimed that uninstalling the Facebook app can save you up to 15% of iPhone battery life. Instead, you can access the Facebook website via the Safari app. 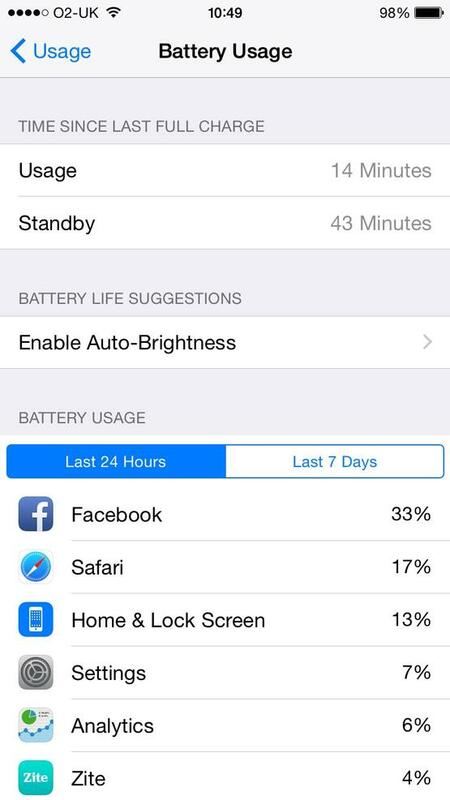 A quick look in your Battery Usage log (Settings > Battery) will reveal how much battery life Facebook is guzzling. Ours has used 26% of our iPhone’s charge in the last 24 hours. 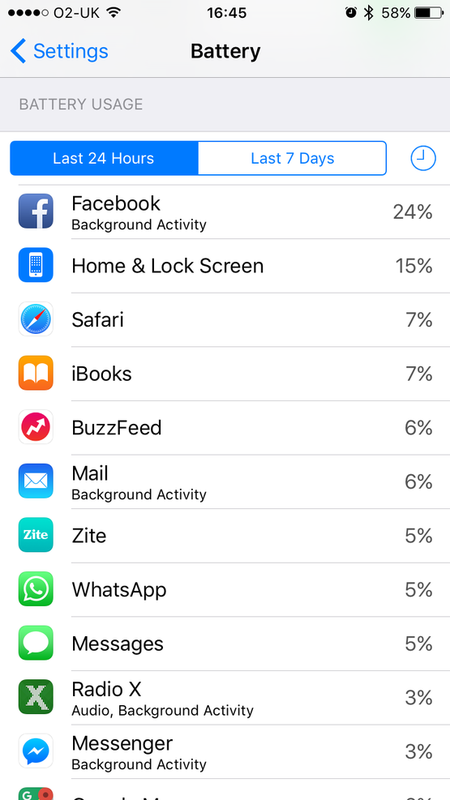 Facebook was also accused of allowing battery drain to occur even if iPhone owners have background app refresh disabled in Settings > General > Background App Refresh. Facebook admitted the fault and then fixed it, but battery drain issues are still plaguing users. While you’re there, take a look at how much battery life your other apps are draining too. That iPad you’re lugging about packs a lot of pixels. An iPhone’s pixel count even rivals that of a MacBook Air. 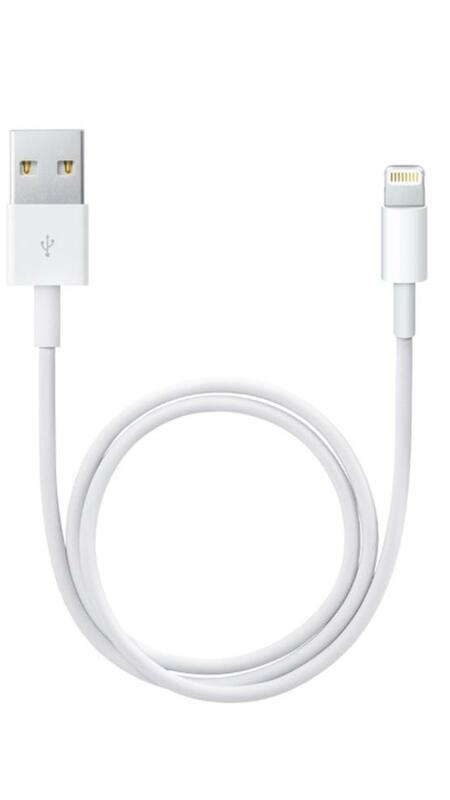 It should therefore come as no surprise the screen is one of your iOS device’s primary power drains. Lighting the pixels on your device’s Retina display requires a lot of energy. In fact, in testing, excessive screen brightness was the single biggest iPhone battery killer we found. A few years ago we ran the following test and found that at full brightness, an iPhone 5 lasted 6 hours, 21 minutes while playing 720p video. When we set the screen to half brightness, the same phone lasted 9 hours, 48 minutes. That’s a huge difference. Luckily you can save some battery life by adjusting the iPhone’s brightness. A quick fix is to turn down brightness using the slider in Control Center, accessed by swiping up from the bottom of the display. Drag the brightness slider down as far possible, but with a setting that still leaves your device usable. You could also open the Settings app, access Display & Brightness and turn off True Tone (this may be Auto-Brightness on older models). This will stop your phone turning up the brightness every time it deems it necessary. 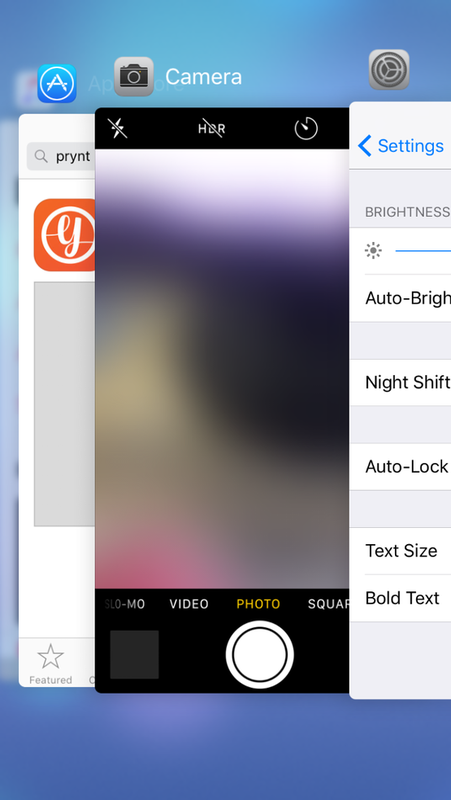 Although Apple suggests that Auto-brightness is designed to conserve battery life – if you find that turning Auto-brightness on dims your iPhone screen then you are probably best leaving it be. While the screen is on, you’re consuming power, so make sure that your iPhone or iPad isn’t awake when you don’t need it to be. 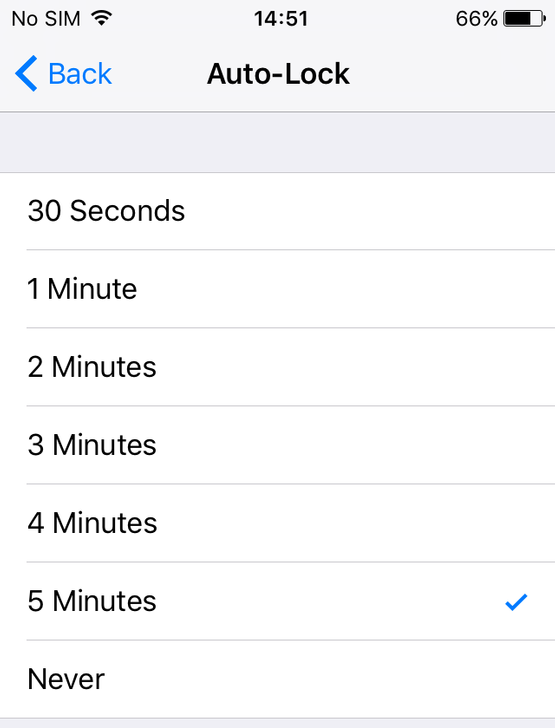 If you want to get the maximum battery life, it’s wise to set the Auto Lock to an ultra-low 30 seconds – an option that has been available since the iOS 9 update. 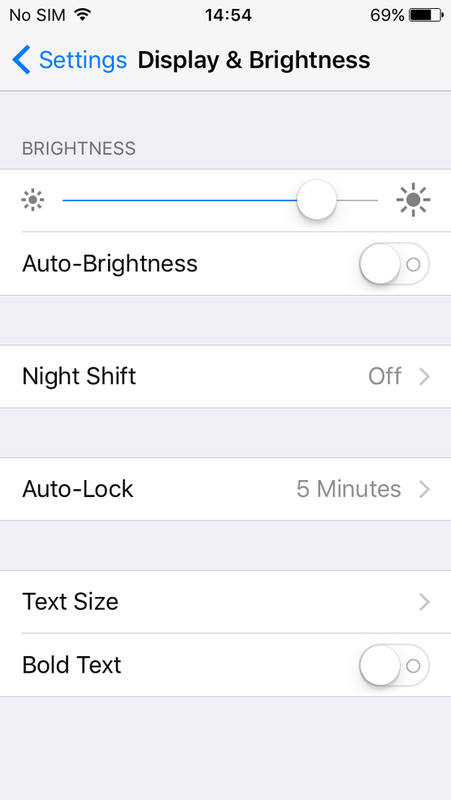 Venture into Settings > Display & Brightness > Auto-Lock (if you’ve got an old version of iOS, you may see Settings > General > Auto-Lock instead) and set your device to sleep after 30 seconds of inactivity. This will provide a substantial improvement to battery life over time. If you really want to max out your iPhone’s battery life, try to get into the habit of pressing the Sleep/Wake button at the top of your iPhone as soon as you’ve finished using it. If you still need a cellular connection but can live without Wi-Fi, you can disable Wi-Fi by swiping up to reveal Control Centre and tapping the Wi-Fi icon to turn it off (if it’s off, the Wi-Fi icon will be black). This will stop your phone from hunting around for Wi-Fi networks it could join. There are a few situations where avoiding using Wi-Fi might stop battery drain. If the Wi-Fi signal is poor then your iPhone will require more power to transmit and receive data. Similarly, if you are rarely in a place where you could join a Wi-Fi hotspot then there is little point in the iPhone hunting for one. However, we wouldn’t recommend using 3G/4G if there is a Wi-Fi network available. There is usually no financial cost associated with using a Wi-Fi network, while you may have to keep within a data allowance as part of your network contact. Another reason is that your iPhone consumes less power accessing data over Wi-Fi than it does when doing the same task over 3G/4G. This is why Apple frequently quotes different battery life for 3G/4G compared to Wi-Fi, with the the difference sometimes as much as a few hours. Tap Settings > Wi-Fi and ensure Ask to Join Networks is set to On. This will help you spot open networks to join. If you have Bluetooth on, the chances are you don’t need it. Swipe up on Control Centre to check if Bluetooth is on: if it is you’ll see the icon that looks like a runic B highlighted in white. 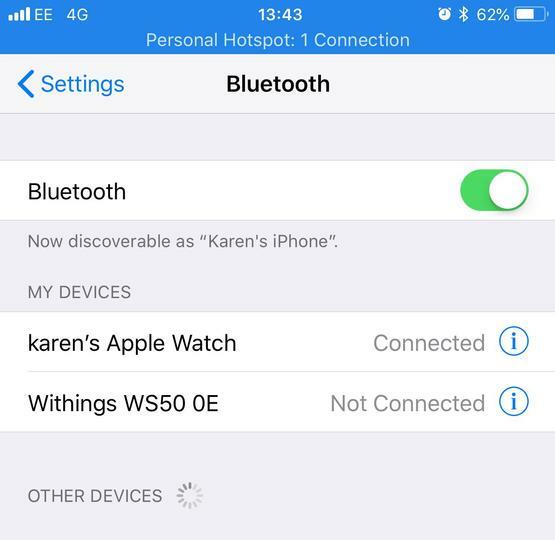 Bluetooth is usually left on after an iOS update is installed, so you may not even be aware that it is on. If it is, tap the Bluetooth icon to turn it off. You can also tap Settings > Bluetooth and set Bluetooth to Off. Bluetooth is considered to be a battery drainer. If you’re not using it to connect to a speaker, headphones, or other accessory, or to use the Continuity features in iOS, then switch it off. 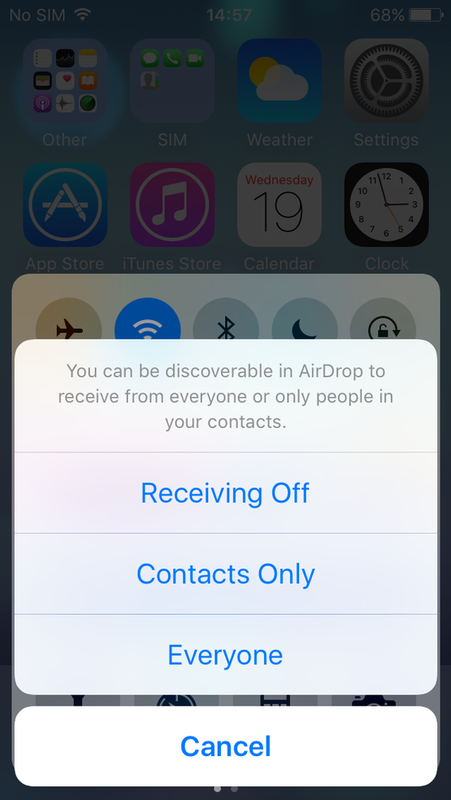 One iPhone service that requires Bluetooth is AirDrop. Added back in the iOS 7 launch, AirDrop allows you to transfer photos and other files to and from nearby iPhones with the same feature switched on. Unfortunately, it could be a battery killer, because of the way AirDrop seeks out nearby iPhones to hook up with. Back in iOS 10 and earlier you could switch off AirDrop in the Control Centre (swipe upwards from the bottom of the screen) and only turn on AirDrop when it’s needed. Since iOS 11 AirDrop is always on – as long as Bluetooth and Wi-Fi are on. So if you want to turn off AirDrop then just switch off those features. If you can survive without data but still need to be contactable you could turn off 3G or 4G. Your data connection can be disabled in the Cellular section of Settings. Go to Settings > Cellular (or Mobile Data) and switch Cellular Data (or Mobile Data) to off. 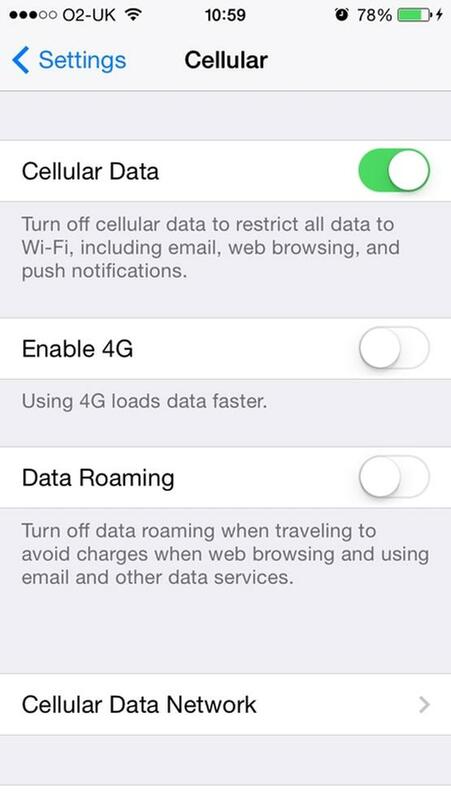 If you have an iPhone that is capable of 4G you may be able to separately turn off 4G here as well. We recommend that you do this if you don’t actually have a 4G contract. If you aren’t using it then switching off cellular data will increase battery life. This has a benefit over just using Airplane Mode, as you will only disable the cellular data portion of your signal, e.g. EDGE, 3G, 4G, or LTE. Normally your iPhone receives two signals at once: one for calls and SMS, and one for data. Now it only receives the signal for calls and SMS – which means you are still contactable, you just can’t browse Facebook (unless you can access a Wi-Fi network). You should also note that, according to Apple Genius Scotty Loveless, the signal strength meter on the iPhone only shows the signal strength for the non-data connection, which means your iPhone could show 2-3 dots but actually have a very poor 3G or LTE connection, thus causing your iPhone to go into heavy search mode. It might surprise you but the volume setting affects battery life too, so if you are playing music or other audio from your phone, turn it down using the volume buttons. Of course you could save battery power by not playing music, or you could switch to headphones, which won’t require as much power as the iPhone’s internal speakers. Note that the music equaliser also takes up a surprising amount of power. Tap Settings > Music and make sure EQ is turned to Off. Head to Settings > Sounds & Haptics and turn off both of the vibrate options, because your device rattling around like crazy when a slew of messages arrives drains the battery like nobody’s business. There are dozens of annoying jingles you can choose from to announce to the world that someone has just sent you a message without the accompanying vibration. Assuming you don’t suffer from some kind of motion sickness or balance disorder, the various 3D effects first introduced in iOS 7 might excite you. These pretty Parallax effects that make your icons and notifications appear to float over the wallpaper might look nice, but they constantly use your iPhone’s graphics processor and are therefore a drain on the battery that you could probably manage without if you were trying to get a last half hour of use out of your iPhone on a long journey home. One thing you can do is switch to static rather than dynamic wallpaper – the wallpaper, first introduced in iOS 7, that moves around as you tilt your phone. This will cut down the power drain a little. When you set a new Wallpaper, tap where it says ‘Perspective Zoom: On’ to turn it off. You can also go to Settings > General > Accessibility > and switch on Reduce Motion to temporarily turn off all the parallax effects. Note that this will replace many system zoom effects with cross-fades which don’t look as nice, but might just give you those extra few minutes power that you need. It sounds obvious to say your iPhone’s battery is drained quicker the more you use your phone, but the speed with which it falls from 100 percent to nothing entirely depends on what apps you use. 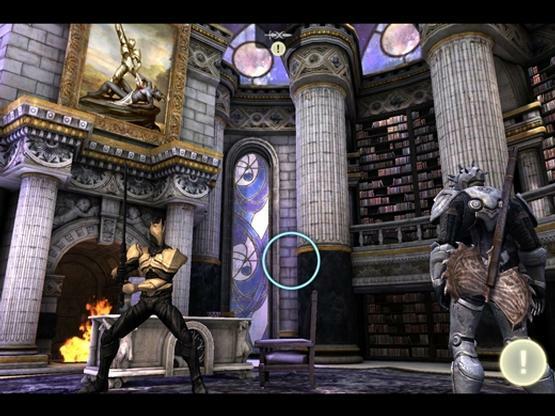 If you play games with rich, detailed visuals, such as Infinity Blade, or 3D racing games like CSR Racing, your iPhone’s battery will be drained quickly. So if you’re away from a charger and waiting for an important call, playing these sort of games is not a good idea if your battery levels are already low. If you’re on the way home and low on power, reading apps like Kindle or Instapaper won’t drain what’s left of your battery terribly quickly. However, it probably wouldn’t be a smart move to start playing your favourite TV series, or, worse, the latest 3D gaming blockbuster. In fact, even quite simple games often utilise complex 3D trickery, and so when in the red battery-wise, avoid them entirely. Isn’t it always the case that the battery on your iPhone runs out just as you take the perfect shot on a night out with your friends? If you’re running low on battery you should keep your Camera app usage to a minimum, and definitely avoid using the flash. Even Siri can be a bit of a drain on battery life, and the Hey Siri feature in particular should be turned off if you want better battery life. Go to Settings > Siri & Search and make sure Hey Siri isn’t switched on. Not familiar with Hey Siri? 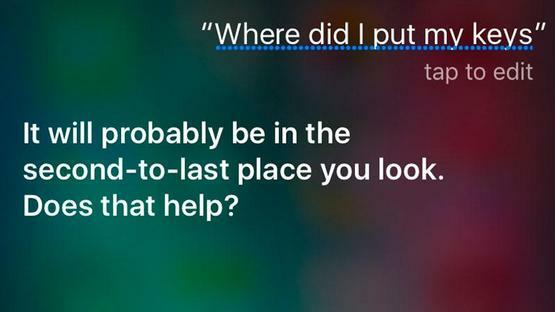 If that feature is enabled, it listens out for the phrase “Hey Siri,” and when it hears it, Siri powers on and prepares for incoming commands. That might sound great (and it is! ), but constantly listening out for the magic phrase will have an impact on battery life. For exactly this reason, Hey Siri used to only work if your device was plugged into a charger, but – due in large part to popular demand – Apple relaxed that requirement in an iOS update. Good news, but something to look out for if battery life is a worry. Similarly, Settings > Notifications might be worth a visit, although there’s sadly no global off switch. If you’re running out of power, editing notification settings for all your apps one by one might actually burn more power than it saves. Each time a notification is received, the iPhone’s screen lights up and it plays a sound, which uses energy. Every message wakes your device for 5 to 10 seconds, and that can add up, if you get a lot of notifications every day, to a small percentage of your daily battery charge. We can live without updates about Words With Friends, so it makes sense to turn off notifications for non-critical apps (incidentally, it was the persistent notifications in that app that lead us to delete it in the end). To stop notifications, go to Settings > Notifications and scroll through the list of apps, looking to see which ones have Notifications turned on. Tap on each one you’re not interested in, and deselect the Allow Notifications option. Multiple email accounts will consume use of your precious battery life. Try to fold all your different accounts into just the one email service then remove the additionals by tapping Settings > Accounts & Passwords and choosing an account and tapping Delete Account. In the case of Gmail, for example, you could turn Mail off but keep your Gmail Calendar synced. Similarly, if you want to make that last bit of juice last longer, turn off anything you don’t need to be synced via iCloud. iCloud uses a fair bit of data and power, so you can save battery life by turning off unused features. Tap Settings > your Apple ID > iCloud and turn off everything you don’t really use: for example, you may not need your Safari bookmarks to be available on the iPhone. iCloud backup only works when the phone is plugged in so you can leave that on. 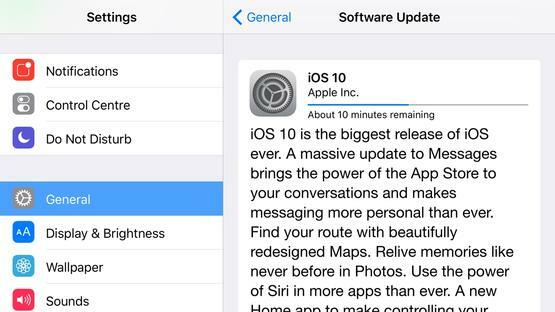 The iPhone can automatically update its time depending on where you are in the world. Because the iPhone determines the correct time via Location Services, this uses a small amount of power. Tap Settings > General > Date & Time and change Set Automatically to Off. Most of the time it is not iOS itself that is causing the iPhone or iPad’s battery to drain quickly, but all the apps that are running on it. There are a number of apps that utilise location services on your iPhone and they can play their part in draining your battery too. It’s even more frustrating when it’s not obvious why some of them need to know where you are in the first place. To stop apps from using Location Services, tap Settings > Privacy > Location Services and either turn off Location Services altogether (by tapping the slider beside it), or deselect any apps that you don’t need to access your GPS. Before iOS 7, if you switched between apps by double tapping the home button, the old app would be put into a frozen state, with limited access to system resources. Since iOS 7 background apps have been allowed to periodically refresh their data. This means when you open the app again, you’ll see the latest updates immediately. This can be useful in certain circumstances, but most of the time is just wasting processing power and battery juice updating apps that you don’t really care about. If you want to get the most out of your battery, turning off Background App Refresh will help. Go to Settings > General > Background App Refresh. Here you can turn off Background App Refresh altogether, or prune the list down on an app-by-app basis. Another feature added in iOS 7, was the ability to have apps update without you manually telling them to. It is a useful feature that means that apps will always be up-to-date, but can be a drain on your battery. Also, some people prefer to update on a case-by-case basis, since occasionally a developer will update an app in a way that reduces user satisfaction. Luckily, you can stop apps from auto-updating. Switch off automatic updates in Settings > iTunes & App Store, scroll to Automatic Downloads and switch off Updates. If you decide to leave any of these Automatic Downloads settings on, ensure that the switch for ‘Use Cellular Data’ isn’t turned on if you have limited data allowance. If you want to keep an eye on your battery level, you may find it easier to see a percentage representation, rather than a bar icon. If you want to see how much charge you have left as a percentage, go to Settings > Battery and activate Battery Percentage. Now you will have a more precise read-out of what life your device has left. All devices will warn when your battery life hits 20 percent and then 10 percent; also, be mindful that even if your battery has a few percent left in it, your device might automatically shut down anyway, so don’t be doing anything too important when your iPhone or iPad is gasping for breath. Apple Genius Loveless does warn that some people become so concerned about their battery percentage that they keep turning on their iPhone to check it, and every time they wake up their phone a little bit of power dies. If despite trying all these tips to get more battery life out of your iPhone, you are still finding yourself running out of juice earlier than you think you should – perhaps your iPhone battery is going from 17 percent to 2 percent in a matter of minutes – your iPhone or iPad might need a battery calibration. Apple recommends that you periodically drain your iPhone or iPad’s battery totally and then charge it up until it’s completely full. That’s down to 0, and up to 100 percent. You should do this at least once a month. This process, called calibration, helps your device estimate its battery life more accurately. Calibrating your battery will ensure that you know when you need to charge the battery, but the procedure itself doesn’t actually make the battery itself last longer. Another reason why your phone might exhibit this kind of behavious is if the battery needs servicing or replacing. You can find out if that’s the case by going to Settings > Battery > Battery Health (Beta). 30. How much battery life have you got left? Frustratingly, there is no easy answer to this question. In iOS 8 Apple began to allow users to see which apps are the biggest battery drainers and you can of course see the percentage of battery power remaining. You can also see how long your phone has been running without a charge, and how much of that time you have been using the iPhone, but it can’t tell you how many hours you have left. This is probably because the amount of battery life remaining is entirely dependent on what you are planning to do with your iPhone. If Apple told you to expect two hours and then you ran a movie on full blast you would probably run out of battery before the movie ended. However, there are third-party apps that can give you some guidance about how much battery life is remaining. If you search the App Store for Battery Saver or Battery Doctor you will see a number of tools that offer system tweaks, with a particular focus on saving battery life. Expect to see an estimate for how much battery life is left, based on what’s running in the background, and your current system settings. If you perform some of the tweaks suggested by the app, you’ll see this number creep up. For example, when testing one such app we switched on Airplane Mode we gained about an hour of battery life – the battery life remaining changed from 8hrs, 17mins to 9hrs, 21mins. Tap on Optimize to see a breakdown of how much longer your iPhone could last if you shut down certain services, such as disabling Wi-Fi or GPS, or reducing brightness. Tap on Remaining for details of how much time you have remaining to do certain tasks, web browsing on Wi-Fi, or web browsing on 3G, talk time, video playback, photo taking, and more. 31. Should you leave your iPhone plugged in? When you get to work do you plug in your iOS devices, so that they’re nicely charged up by the time it’s h0000000000000000000ome time? In principle this should mean your iPhone (and iPad) always have enough power to get you through the commute home. But could this practice of leaving your iPhone plugged in all the time cause damage to the life of the battery? There is some debate about this. The iPhone is designed to stop charging its battery once the battery is fully charged, so this should mean that the battery can’t be ‘overcharged’ as such. However, we know from our experience with laptops that have been left plugged in at all times that the ability of the battery to sustain a charge seems to deplete over time. The best advice is to make sure that you drain your battery down to zero at least once a month if you want to ensure that you get a good life span out of your battery. This one’s a last resort, but if you need an iPhone to survive a weekend or a power outage, and its reason for being powered up is essential communications only, turn the device off when you’re not using it. First, that’ll stop you being tempted in just having another quick go on Candy Crush; secondly, it’ll also ensure even background tasks aren’t slowly supping power. To turn your iOS device off, hold the sleep button for a few seconds and then drag across ‘slide to power off’. Note, however, that if you only have a few percent of battery left then your iPhone might not power on again if you turn it off. So switch to Airplane Mode in those circumstances. If you still need more battery life after all these tips, you should consider an external battery pack, or a case with one built in. 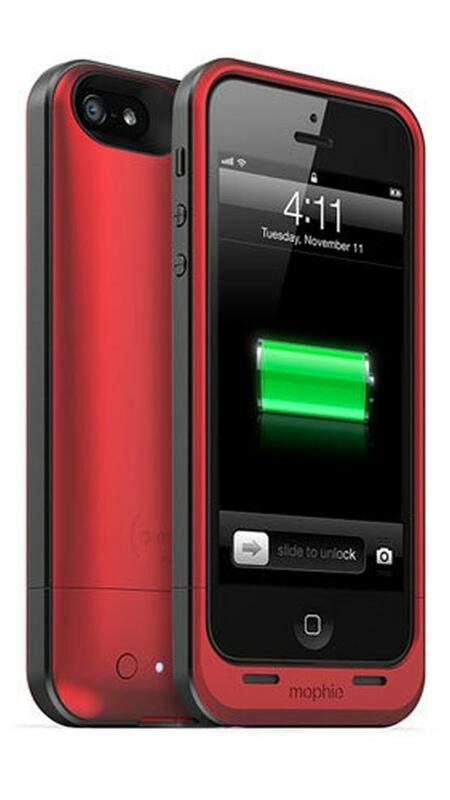 There are many on the market that are worth considering, such as the Mophie Juice Pack Air (pictured) that can be used to keep the iPhone running for longer.